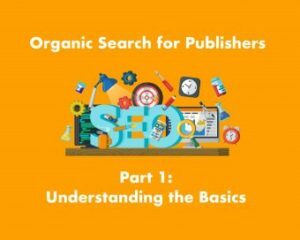 Organic Search for Publishers is an eight part series designed to help you and your publishing organization develop and implement an effective content machine strategy. The blog series and transcripts are adapted from a podcast series 2040 Digital created for Subscription Insider. To subscribe and listen to the podcast series (all eight episodes are available) visit our page, Subscription Insider’s website or go to iTunes. The content that follows represents the transcript from Episode One of Organic Search for Publishers. If you want to read the introductory piece that sets the stage on changed behaviors and content consumption, please see the first post of the complementary blog series. Kathy Sexton, the interviewer, is the Publisher and CEO of Subscription Insider. KGS: I guess I had a question and you can probably address it, which is regarding cards and mobile, where if you’re not the first result, you’re probably never going get found. KN: Absolutely, and I have some slides coming up to show how those rankings and the behaviors correlate. With this slide particularly, we’re in a Google world. You have on average 64% of all traffic-and this goes across countries as well with the exception of China-that the major population is using Google first. Microsoft has attempted to carve out a niche-particularly with the Bing product-which, on average, this actually in this May through June screen, is actually higher than normal, it’s usually in the upper teens. Yahoo continues to take a dive, where it was once a predominant search engine, they had de-emphasized the search. They have at one point partnered with Bing. So there is less credibility, perceived or real, with consumers that searching on Yahoo is actually going to produce the result they seek. One of the other challenges: Yahoo is first and foremost today a content delivery engine, and curates or develops a lot of its own content which ultimately does wind up competing with a variety of different publishers who may be publishing around the same subject matter. And people get frustrated because Yahoo will indeed show their content first. And Ask and AOL, you see very small percentages. They remain a source, sometimes to an older demographic because one set that as their predominant search engine at a particular period of time, and as the companies, Ask and AOL, continue to evolve and get picked up by the likes of Verizon, they may rise again in prominence from a search perspective, but it’s highly unlikely to ever be able to compete with the massive use that Google receives. 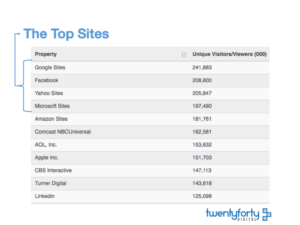 This is showing as well, statistically, the monthly unique visitors to the major websites. And as you see, as I talked about on the previous slide, Google, Yahoo and Microsoft, particularly tied to search, are always in the top five. Facebook as well. So back to your question, Kathy, about the way prioritization of engaging in social. Facebook by the virtue of the amount of people over that 50 mins per day that are consuming content is always a major traffic source, and within the top five. The others below that tend to be more content oriented. Amazon is now including not just its e-commerce front end, but also its variety of on demand music playing services, which roll up to this number. Comcast NBC-Universal, formerly Comcast, simply being an infrastructure oriented cable company, now with the acquisition and merger with NBC-Universal and its content, are drawing a significant amount of traffic by virtue of what they are offering. They as a company have grander plans, will continue to move themselves up on the rest. Alright, we love search. And going back, Kathy, to both your questions, but also behaviorally how significantly digital has impacted our day to day, showing a correlation here, it rises one-third of all users going back to 2002, so the web really took hold in the late 90s. That was still very niche focused, during the “Dot-com” era, where everyone thought everything is possible, and digital is really where that began resonating with all of consumers. Today, moving from one-third, now almost 60% of all adult internet users are using and interacting with search. So as a result, it’s growing roughly 20% a year, reaching nearly every online American, and billions of people around the world. It drives an incredible amount of online and offline economic activity. If a publisher takes a step back and actually looks at the analytics associated with their marketing automation, or they’re simply looking at Google Analytics, they are going to see in 90% of the cases ,organic traffic is by a large margin their major traffic source to their site. Many publishers these days are very reliant on using email or direct marketing to a very limited list, and not actually maximizing itself and its content to take advantage and try to deliver to that significant organic traffic coming into their website. Here on the left, the visual is really just bringing forth the variety of different terminology that people can use to bring people further into the site, and recognize that not everybody knows every nuance about their content or who you represent, and that we often apply institutional filters to how we think we should be interacting with consumers and prospects and not taking a step back and recognizing how they may be thinking and how we can match their thinking to connect them to our organization or our content. So Kathy, back to your question about the ranking. Organizations do want to aspire to be ranked as high as possible. It is highly critical, back to the concept of authority, if you are in the first three or five results below the actual google ads when someone searches, whether that is credible content, peer reviewed, authoritative or not, the searcher’s perception is indeed that it is highly credible, and it is the authoritative content they seek or “Google would not have shown it to me”. So Google and the ranking instills trust in the consumer, as to the worthiness and the relative importance of the company and the concept that it represents. So to the actual ranking, this is statistics across all subjects. The number one position on google search results receive 18.2% of all click-through traffic. You are already having a significant advantage with getting that organic traffic into a website, and the challenge is if you’re not doing anything by virtue of having that traffic come in and trying to move them further into your own journey in the content you offer. The second position receives only 10.1%, the third 7.2%, the fourth 4.8%. All others on that first page at most will receive 2% of the click through traffic. Correlated to the amount of statistics in people that use Google versus Bing, if you have a number one position on Bing search result, you’re averaging a roughly 9.66% click through rate, much different than the 18.2% on Google, but I just want to call forth again the amount of people that are using Google versus using Bing, so that there’s not a statistical correlation between the tool. The total average click-through rate for the first ten results is 52.32%, and again that is aggregating the first 10 results together and that performance, for Bing the first ten results produce 26.32% click-through traffic. So here is the challenge: if you are an organization and you’re finding yourself on the second or third page or even the bottom half of the first page, you are likely not going to get the traffic that you intend to get with organic traffic. As you will see if you look at your Google Analytics or your other analytics collection platforms, Google is always the predominant half from which you are getting that organic traffic. It is sending 90.62% on average of traffic to websites. Back to the comparison of Yahoo and the others not having the same prominence. Yahoo is only sending 3.78%, Bing itself is only bringing 3.72%. So what I would hope to share with you on the slide is that yes, you want to pay attention to your ranking on all search engines, but you will have the best revenue and relevance value by spending your time and resources within Google to ensure your content is getting ranked appropriately, and people are understanding what that content is, and that you are moving that traffic through to your website and seeking conversions or engagement with that traffic. To drill in the point, this happens to be a publishing organization, but you will see roughly the same spread regardless of the size of the organization or the content focus of an organization. 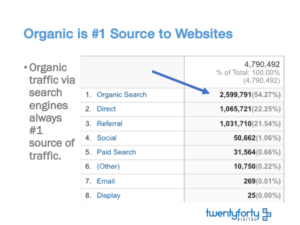 Organic search is first and foremost your major driver. In this particular instance it’s 54.27%. That can go up as high as 75% for some organizations. Kathy back to your question that social is going to produce results. Number 4 here shows the statistic on social which is a very good average of what all organizations are going to see. There is the challenge both in reality and perception that we need to maximize social, that often first and foremost attention to organic search is going to produce the best results, which will trend down and help social along. KGS: So, how does this chart differ between organizations that have differing paywall strategies? As an examples, a news organization that is monetizing with advertising might have a very different experience and very different metrics than a B2B publisher with a hard paywall or somebody with a mixed model. How are you seeing this manifest itself in this data? KN: Kathy, it’s actually the same. In this example, and I can’t reveal the source, but this example is from an organization that has a paywall. The direct and referral traffic will most often manifest itself there, you can dissect the direct traffic and the referral traffic down to obviously known and unknown users, to correlate back to your actual subscribers or those that are paywall customers. The other consistent element here is number 7 with email. Many organizations are continuing to focus on traditional marketing and engagement strategies. There is value to direct email marketing, no doubt. That will always produce a respectable result. When you’re looking to expand your market, people often look first and foremost at doing email and doing emails from a mass-marketing approach. It always underperforms when you are looking at a more mass-market approach because, given that we all have this short attention span, and also bringing back that there is a significant amount of communication electronically coming at us at all times, whether it is social, Facebook sending an alert, the Wall Street Journal sending an alert and so forth, because that is a very active form of engagement that is catalyzing our desire for goal attainment and dopamine. You’re more apt to engage with that content than you are opening an email that doesn’t speak directly to the problems you are trying to solve or the questions you have. There are some tactical things here as well that I mention later on. Many times people focus on the mass marketing email, they don’t describe the email being sent. So what shows up in the actual two to three lines in someone’s box or someone’s mobile device, is a link. It is a coding link to that particular subject. It’s not giving them a call to action, it’s not giving them context, and then often the subject line is not correlated directly to that particular segment or persona to get them to engage further. Under number 7 it also breaks down analytically. If you’re using what’s called a UTM code where you can actually track your success of a variety of emails, across all of our clients and a variety of other data sources, those tend to underperform where they’re not hypertargeting. I just want to share that, because organic traffic again is first and foremost- regardless of the type of organization- always going to provide the highest level of potential value to you. You do need to tweak and pay attention to email, but you need to start doing that in a much different way respecting that people are thinking about things differently. You need to look at it as they have a problem, you are the solution, opposed to just mass communication out, “we have a new issue out” -is not going to draw them in. What is going to draw them in is very specific to them, based on who they are and those nuances that we spoke about earlier. So the new reality- If you want traffic that creates readers and results in engagement you must accommodate the social platforms. You must accommodate and deliver to organic traffic using SEO- and I’ll talk more in detail about that later- and you must ensure the site search functions direct and allow “discoverability” of content on your site. If you are not describing and curating your content well, and you’re relying on a substandard search technology, you are in essence creating a level of frustration when the member, subscriber, or the prospect, tries to find content. And you really never want someone to come to your site then go back to Google because they can’t find what they know exists on your website but they believe Google can actually surface it. So in simple terms, there are a lot of ranking factors that I will bring up in a few moments, but ultimately there is tension going in two different directions that needs to come together, to first and foremost provide the user with what they want and also provide Google what they want. There are algorithms, there are technical things, there are connectedness and curation that you need to do to describe your content, to ensure that the users are indeed getting what they want, and the algorithms are understanding who you are, what your content is, and who it can ultimately be served to. You want to match user behaviors, their wants and needs, back to that problem to solution scenario, and also recognizing how algorithms interpret and deliver to those needs, wants, and behaviors. The algorithms include artificial intelligence, and there is constant maximization of the intelligence in order to use that as a predictive engine to put content into people’s hands, and so you do need, again, to understand the technical factors and in the different ways that people search, and later on I will be offering some tools on how to help you with both. 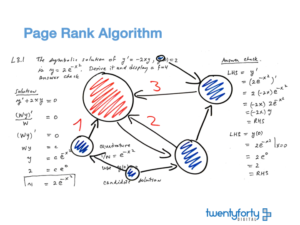 So, two of the most important algorithms that you need to know are Edge-Rank and Page-Rank. Edge-Rank is Facebook, Page-Rank is Google. 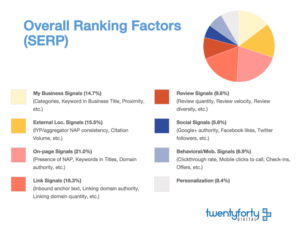 Google uses over 200 different ranking factors. Page-Rank is indeed what google was first founded with and it remains the major mechanism to rank content with the other 199, roughly, ranking factors coming up below it. One of the challenges here, and when I teach my class in University of Maryland, we have a few hour lecture and discussion about filter bubbles. Many people don’t realize that what they’re seeing on Facebook and what they’re seeing on Google may actually have a bias to it based on your prior search behaviors, based on prior content that you have consumed. This is most well represented in the recent election, where if you had consumed a certain level of Democratic/Liberal content you are more likely to see similar content and not see the contrasting content. If you are Republican/Conservative or Independent you are likely to see results returned to you that were in a similar vein, and highly different than someone else who may have different beliefs or consumption behaviors and may have used the same terminology. To bring forward a real world example, in a class exercise we had people search on China. The majority of the cass got back political information about China or tourist information about China. Two of the students got back information on sports shoes that are produced in China, and we had a very healthy discussion about it. Most of what the two students frequently searched for were basketball shoes. KN: The history in their browser, and what Google knew about them, was leveraged by the algorithms. The AI calculated that it was highly likely that these guys weren’t looking to travel to China, they weren’t looking to learn about the government, they actually just wanted more shoes. And so, I suggest in any time I give a presentation like this, or a discussion, that you may want to use multiple computers if you are trying to remove the bias, because each of those computers will actually be representative of a different person, in that behavior, that history is going to beget what you see back. KGS: would stealth mode help, in research mode, if you’re researching this? KN: The interesting thing- and I’ll equate this to people who often dump their cookies on a daily basis- is many companies have found a way to get around that. Using an example: if you shop various companies online, some will create a numeric identifier correlated back to your IP address, at your home or at your office, so if you happen to dump your cookies that evening, by the next morning the cookie or connective identifier is usually back, because the systems are constantly searching for you at your IP level or your device ID and correlating it back to the numeric identifier that they have at the company database. KGS: Well that’s a whole separate discussion then on privacy that we could have. KN: Yes, exactly! Yes it is. KGS: But focusing back on publishers…. 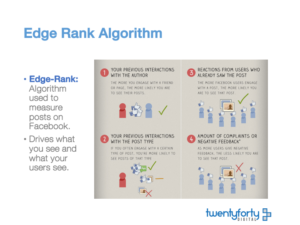 KN: Page-Rank is based on a variety of different factors, if you as a publisher and you have maximized your content and are matching those ranking factors will determine if you are getting in front of the people you are trying to reach. Now let us focus on Facebook. Facebook first and foremost focuses on the law of affinity. A Ted Talk titled the “Curly Fry Conundrum” provides a great and easy way to understand the use and power of affinity. What the researcher demonstrates is an actual national academy study focused on an affluent student going to a prestigious school. One day he happened to “like” curly fries, then that went out to his network that he “liked” it. Well then, other people “liked” it. What the research demonstrated was that by virtue of the affinity rule, people who were in an affluent socioeconomic status at this particular university liked curly fries more than others. Now that’s not reality, but with Facebook’s algorithm based on affinity, that is actually the data that was produced. So, just to put that out there, algorithms aren’t perfect. Kathy, back to your question about social, there are things in those regards that you kind of need to have in there as a check and balance to understand reality vs the outcome, because the outcome itself may have a certain catalyst that drove the result. Let me focus on the slide showing Edge-Rank broken up into common terms. I think what everyone needs to walk away with here, what I would suggest, is that the reason you are seeing things is not just because of your own behaviors, it’s because of others. So if you have a group of subscribers, members or customers who have liked you on Facebook, what they ultimately see from you is going to be impacted by these different factors. 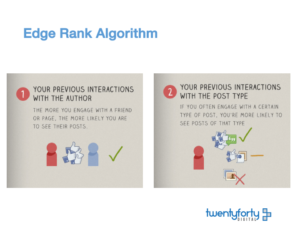 So the more you engage with a friend or page, the more likely you are to see their posts. To Kathy’s question earlier, that would first and foremost beget that you have to be very active, and not just publishing out to Facebook, but commenting along with your subscribers, looking for ways to engage your subscribers. It isn’t coming in in the morning and saying, “ok, I’m going to use HootSuite, I’m going use HubSpot Social, and I’m going to schedule these posts”. Well, that works to get your content out to a very limited audience, and it may hit ten people opposed to the 100 people that are fans of yours and have “liked” your page. What is going to increase your results is directly correlated to the level of engagement that you create, so it does need to be a very active pursuit to increase the presence, increase the engagement, and therefore improve your reach from an affinity. So, next is the previous interactions with the post type. 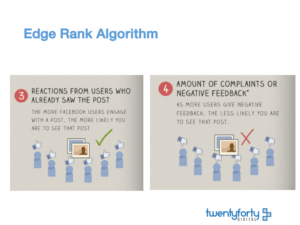 If you were able to engage in a certain type of post you are more likely to see that type of post. This is most intimately seen in that if you happen to engage with a lot of pictures, based on what your friends and your overall network are posting, you are telling the algorithm “that’s really what I want to see”, so there’s text based content that somebody’s posting, because I really like to look at images, I’m going to see the images first and foremost and I may never see the text. 3 and 4 here equate to negative and positive reactions. Number 3 focuses on reactions from users who already saw the post, so if you have a lot of likes coming in, a lot of smiley faces, a lot of hearts from that person’s network. When you log in later in the day, you are more than likely to see that person’s posts because Facebook determined a lot of other people liked this other person’s posts, therefore I’m going to show it to someone else in the network. In contrast, if a person posted in the morning and a lot of people provided negative feedback, Facebook is going to move the post off the list of what it is going to show others. The post therefore is going to have a very limited reach and if you are an organization who may be getting negative feedback…. Well your reach becomes very limited. Sticking something out there, publishing it in the morning based on the schedule and not monitoring it to see how people are engaging or what people are doing with it is not going to get you where you need to go. 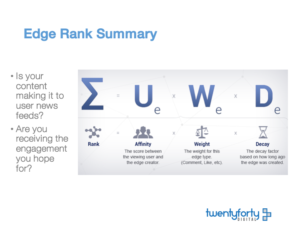 To finish up the Edge-Rank and Page-Rank, this brings forward in a formulaic way how rank equates to affinity: the weight based on a comment, the “like” and the decay factor. There’s always a time decay factor. What many people don’t realize is that what you see when you first log in to Facebook actually immediately starts with bias and that Facebook, based on its algorithms are indeed showing you what it thinks you want based on what others have done. Many people don’t take the moment to ask Facebook to show them the most recent posts, which is an unedited version of your timeline and your network, where you are actually seeing in entirety and currently what people are posting. 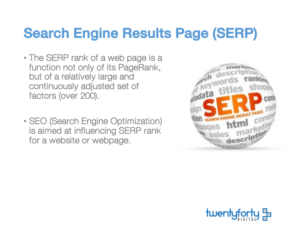 You may hear about the term SERP. So back to the examples I gave about ranking and how people interact, that page one, page two, page three, page ten of the results, is the SERP. To show quickly the overall ranking factors that boil up to what you as a user or your users actually see, is emulated here in the list. This particular visual is from Moz. 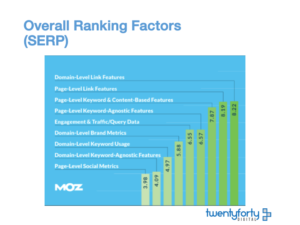 Moz does a terrific job, they even operate a basic tutorial on SEO and how to maximize the description of content in order to improve its overall ranking. There are Domain-Level Link Features, Page-Level Link Features, Page-Level Keyword & Content-Based Features, some of which I’ll go through in a few moments, Page-Level Keyword-Agnostic Features and so on. Engagement & Traffic equates back to the amount of people who are interacting with that particular piece of content, clicking on the links, and how that corresponds to what is in essence Query Data, which is the key words phraseology and questions people are using that produce that set of content. There are in essence numerical correlation and points that play direct and in-between each of these different rank factors based on population and based on frequency. Next is Domain-Level Keyword Usage, for any organization: are you being consistent on your terminology? Or are you practicing what is in essence called keyword baiting, keyword loading, keyword stuffing? In order to drive traffic? This next slide presents the ranking factors more visually and also groups them in their relative buckets. So you have Business Signals which is categories, Keyword in Business Title, etc. The External Location Signals really speaks to where this traffic is coming from. On-Page Signals, the Presence, the Keywords in Titles, the Domain Authority. The Link Signals, the inbound anchor text, linking domain authority and so forth and I actually have a couple examples about schema oriented structured data which many org overlook but has become very critical to ranking. Review Signals, Social signals, how much traffic is coming. The interesting thing here to bring up is Google+, and back to Kathy’s question, people always first and foremost hear about Facebook, Twitter and even Pinterest- those platforms resonate well with the majority of the population. Google launched Google+ years ago, and it has never experienced mass success. Now, from a statistics perspective it has, in that anybody that has a Gmail account is correlated to a Google+ account, but why it’s important to play with Google+ is that with Google itself you get certain bonus point by virtue of having a company or content presence on Google+. Even though you don’t actively publish into it, the fact that you indeed have it is going to give you a few points within the social signals box. Next is Behavioral and the Signals. It really is the click through rate, the mobile clicks, check-ins and so forth as a way people are engaging across the experience. One of the most important items reflective of behavioral activity and personalization is that many organizations use Google Analytics. But what many organizations are realizing is that anonymous data based on how your “users” are interacting, the email as a driver of traffic and the organic traffic, do indeed all roll up into Google’s overall database to help understand the numeric “points” and the algorithms behind the variety of different ranking factors. You can self-select to further participate and actually communicate out some name data to that to have some industry benchmarks. That can be helpful, but again you need to recognize that you continue to contribute out your own business data to others. This wraps Episode One. In Episode Two, Kevin will cover “Why Segmentation and Voice are Important“. Check out 2040 Digital’s overview page for the series or read the first post in the complementary blog series.